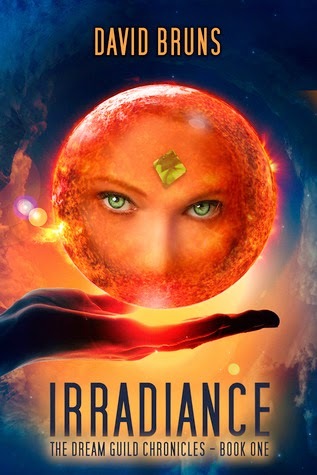 Irradiance is set on a planet called Sindra in a distant solar system, where the people have been genetically engineered for centuries to eliminate unwanted anomalies and enhance certain traits. Those born with unwanted traits are "recycled" at birth. Yikes! This is a sci-fi/fantasty tale that bears some frightening similarities to some possibilities of what could happen on our own planet in the not so distant future, much like the terrifying Big Brother from Orwell's 1984 which is pretty darn close to what is happening now in our world. Maribel is a wife, a mother, and a scientist who has discovered something that her government doesn't want their citizens to know. Their planet is dying and there isn't much time left. Desperate to provide this information to the public in spite of the danger to herself, and her family and friends, Maribel has to make some tough choices. It's a well written story, with a good plot and I read it in pretty much one sitting - so that tells you right there that I was hooked. My only (very minor) complaint is that I wanted a little bit more at the end - an epilogue - but since this is the first book in a series I suppose I must wait for book two to know how things work out. Unlike many series these days I did find the ending satisfying even though I wanted more. I guess that is exactly how a series should work, right? Want to check out Irradiance for yourself? Click here to find it on Amazon where you can read a sample and/or purchase your copy. Have you read any sci-fi/fantasy books that make scary predictions for our future that are frighteningly possible? Tell me about them in the comments. The Community is your first responsibility as a Citizen. So says the First Edict of post-Reformation Sindra. Maribel is a new mother of twins in this bioengineered, telepathically networked society of comfort and safety, where the only relationship that matters is the one between a Citizen and her Community. But Maribel is also a scientist, and scientists follow facts—wherever they lead. Her search for the truth awakens emotions in her she never knew existed, uncovers ancient powers long hidden in Sindra’s history, and has the potential to destroy her Community. A dying planet . . .
A desperate parent . . .
A daring plan . . .
IRRADIANCE is the story of Maribel’s choice. I always knew I’d be a writer—someday. I spent six years as a commissioned officer in the nuclear-powered submarine force chasing Russian submarines. Then the Cold War ended and I became a civilian. For the next two decades, I schlepped my way around the globe as an itinerant executive in the high-tech sector, and even did a stint with a Silicon Valley startup. In 2013, I took a break from corporate life and wrote a book. I enjoyed it so much that I wrote another (better) book, the first in a series. For the writer in me, my “someday” is today. My wife and I are self-confessed travel junkies. We’re proud of the fact that both our children had to get extra pages in their passports in order to fit all their visa stamps. Together, we’ve visited over two dozen different countries and almost all fifty states, but Minnesota is home. The origin story of the Dream Guild starts on the planet Sindra in a dystopian society called the Community, living on borrowed time. Then one brave scientist learns the truth and decides to take matters into her own hands. A refugee of Sindra tries to make a new life among a clan of superstitious hunter-gatherers by offering them the ability to dream. A sci-fi/fantasy adventure story about two friends caught in a cross-galaxy battle complete with superpowers, inter-dimensional space travel and dreams, lots of dreams. An Internet-age bounty hunter gets more than he bargained for when he starts a personal collection of trophies.